When individuals are out on fossil collection, one needs to carry specialised tools and equipment. These are required to hunt for fossils at Folkestone. It is important to prepare before collecting fossils as then the visit would turn out to be productive and safe. There are certain key tools which one needs to carry when involved in fossil hunting. A steel point is helpful. One might not always need a hammer and chisel to remove matrix which is surrounding the fossil. All it takes sometimes is just a steel point which could help to carefully work with precision. It is relevant when the matrix is crumbly as chiselling would otherwise lead to shattering of a fragile fossil. A hand lens is another thing which is very useful, as it helps the fossil hunters to examine the finer details of the specimens. It is nice to note how well some of the structures are well preserved and a lens with a magnification of 10 helps to view clear details and to protect it from damage. A strong bag is essential and will help to set aside a bag which would only be used for fossil hunting. This is because, the rocks are generally dusty and muddy causing a mess when it comes into contact with. The bag could also carry the other items for fossil hunting and it would make it easily accessible. The bag should ideally be having a strong holder, back support with strong straps, large pockets with a rain cover and it would be prominent when brightly coloured. Good walking boots help individuals to protect from ankle sprains and provide more grip along slippery surfaces which keeps it dry in wet conditions. As during the fossil hunt, one would encounter different terrains, it is indeed essential to have footwear which would support this and is especially designed to serve the purpose. After a successful expedition of fossil hunting, one should protect the find too, whether it is onsite , display, in transit and in storage. A planned expedition is always essential as different sites have different terrains and weather conditions. Once a fossil is found the surrounding matrix should be examined and one needs to be careful on how to remove the specimen without breaking it. This takes a lot of patience and consideration. The extraction should remove specimen with some matrix attached as this will prevent from specimen breaking in a fragile way. Also this gives more support in handling and when in transit. With care intact specimens can be collected avoiding breakage. If a specimen breaks the pieces can be pieced together and repaired. Fossil collection which is generally called fossil hunting is the collection of fossils for scientific study or as a hobby and curiosity. Fossil collecting is done by amateurs and experts and is a predecessor of modern paleontology. This fossil collecting is done to enhance scientific value. Still today commercial trading of fossils remain and is being practised illegally. There are many techniques which are used to collect fossils. The techniques which are used in fossil collection varies depending on the sediment or the rock in which the fossils are found. 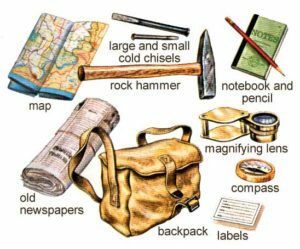 Many forms of equipment is essential when collecting in rock, a geological hammer, many different cold chisels and a mallet, which could be used to split and break open the rock to reveal fossils. As the rock is found in many layers, the layers should be split to reveal fossils. Flat bladed trowel and stiff brushes are used to excavate soft sediments made of sand , silts and clays. The fossils are separated by using a variety of sieves with different mesh sizes and it is used to separate gravels and sand. Sieving however is harsh for fragile fossils and it could break off. Generally water is run off to help remove silt and sand. This is wet sieving. Generally the fossils are very fragile and is not completely extracted from the surrounding rock. The fossils are being transported with protection and one could use cloth, small boxes and aluminium foil. Sometimes large specimens which are fragile would need to be protected and supported with a jacket of plaster prior to removal from the rock. If a fossil is left in place a cast maybe produced using plaster of Paris. Fossilised tracks are generally documented with casts. The persons who go fossil hunting should have hard hats, safety goggles and good boots with protective gloves. Proper preparation and cleaning is needed. Smaller fossils could need a stiff brush which can be used to dust and clean the fossil. Larger fossils could use chisels to remove the large bits of dirt, but there is a risk that it may damage the fossil. Water can help to dislodge from the rock and even crumble apart as it is very fragile. Some even use dental tools to remove small amounts of rock from fossil. Once the fossils are collected, it has to be categorised appropriately so that it would have proper scientific value. Data logs and sketches can accompany detailed field notes.